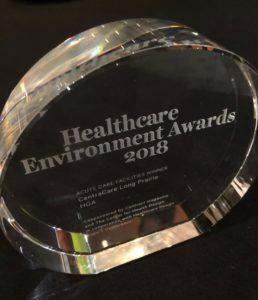 CentraCare Health–Long Prairie, designed by HGA, has won a 2018 Healthcare Environment Award for Acute Care Facilities. Located northwest of St. Cloud, Minnesota, the 63,000-square-foot, 14-bed acute inpatient care center includes operating rooms, lab, procedure rooms, infusion and imaging suites, outpatient clinic, and other services to meet current and future medical needs for the rural community. The jurors praised the hospital for introducing a universal care platform that optimizes operational efficiencies, featuring eight universal rooms that flex back and forth between surgery, observation/short-stay rooms, and emergency depending on time of day and patient volume. The planning strategy “allowed us to reduce the number of treatment rooms needed by 30 percent, and shave 3,600 square feet from the building,” said Donovan Nelson, Associate Vice President and Senior Designer with HGA. Co-sponsored by Contract Magazine and The Center for Health Design, the Healthcare Environment Awards honor healthcare interior architecture and design across a range of project types. For more information, visit Contract Magazine.